In a world of out-sourcing and virtual everything, more and more small and medium-size business owners are choosing to pay for the support and services they need, at the time they need it, rather than hiring more staff. Paying a moderate retainer to have 24-hour access to experts who will solve their problems is often more cost effective, faster and more efficient than having permanent in-house employees. If you are currently offering free support services, maybe its time to start thinking about how you can create a premium tier that commands a fee of some kind. Customers are notoriously impatient and want immediate assistance and support when things go wrong. Increasingly they are willing to pay extra for personal attention and faster response times. Offering a paid for support service beyond the free online FAQ sections and user support forums will always appeal to sections of your customer base. Or, maybe you're thinking about how you can set up a new business where you can charge for support-like services. For example, do you have years of experience or technical expertise in a particular area or technology platform? Are you a life coach or executive assistant with killer skills? Do you know WordPress, Joomla or Linux better than anyone else you know? Do you love tinkering with websites? Are you awesome with accounts? Could your knowledge help to solve other people’s problems? If so - you could be sitting on a lucrative untapped revenue stream. Setting up a system (website) that collects, manages and streamlines the process of tracking customer requests and which is also tightly integrated with a payment system will make it a lot easier to unlock that revenue stream. Regardless of whether you're looking to transform an existing support operation or kick-off a new business, there are certain key decisions that need to be made. 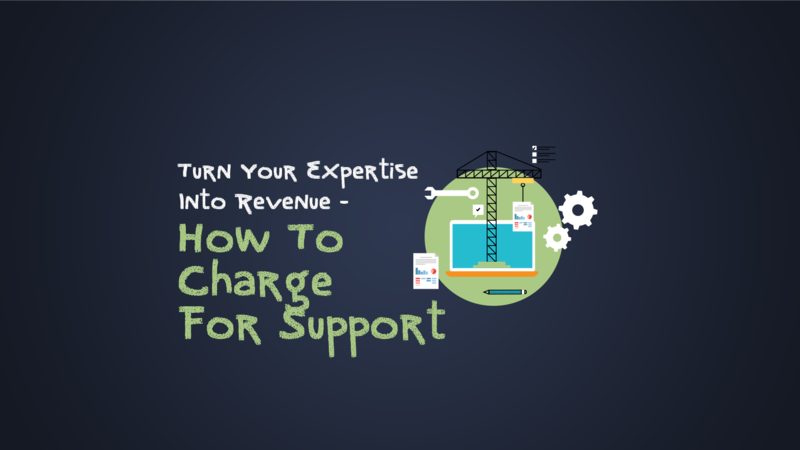 This article explains how to charge for support services and how to set it up properly so it’s hassle free and makes money from the start. Initially there are two important decisions to make when considering how to charge for support. First, you have to decide what business model you will use for your paid support system. Second, you need to ensure you implement that model correctly, using the right software. If you are thinking about charging users to open support tickets you need to decide what business model is going to suit your product or service offering best. Do you want to offer one tier or multiple tiers of support? Do you want to offer a subscription or pay-per-use model? One tier or multiple tiers of support? Do you want to offer a single premium tier or will you have multiple tiers? Will the lowest level tier be a free tier – perhaps offering access to a knowledge base, video tutorials, FAQ sections and user forums. Apart from set up, the free tier should not cost you anything to offer and deliver. If you sell software, having a free support tier is always advisable because it helps to engage the customer with the software and helps to ensure they learn about it and use it. After all, if they don’t use your product they are never going to pay for additional support. Is there potential for a second premium tier? Perhaps offering faster guaranteed response times or the ability to open unlimited support tickets each month. The premium version could give the user access to more of the knowledge bank, closed Facebook groups or more advanced tutorial videos. Ideally you are looking for additions that once created, don’t add to your costs but add significant value to the end user. Closed Facebook groups can be particularly effective as they are free to establish and users can share experiences and help each other solve their own problems which saves you time. If you sell a physical product that require on-site service you might only have one tier of support - a service plan that is always sold with the main product. Or you might have a basic tier and a higher-tier support plan that provides a faster turn-around (e.g. : next day service vs same-day response vs 2-hour response times). Once you've decided what tiers of support you want to offer, you'll have to decide whether you'll be charging on a monthly/annual basis or whether you'll be charging on a pay-per-use basis. If your business is acting as a 3rd party technical support contact for software or websites designed by others you might use a subscription model. On the other hand, if you are providing an option for a premium support level for a product you sell and service, you might opt to use a pay-per-use model where the user will have to purchase some sort of ticket-token before being able to open a support ticket. There are no hard and fast rules on this and obviously it depends on how much you can charge on a pay-per-use basis but an on-going subscription fee will usually yield the most revenue over time. Partly because customers forget about it. The payment, usually not that large comes off their credit card every month and they don’t really second guess it. So long as you deliver value many customers are happy to pay for the peace of mind that they can contact you anytime they need to. Finally, you will have to decide the price you are going to charge on monthly or annual subscription or on a pay-per-use model. This price needs to be fully costed to ensure that your paid for support service makes money. This will possibly require some trial and error to establish baseline use of the support services. There is no point offering unlimited support tickets if you discover over time that you start losing money once a customer logs five support tickets in any single month. You need to know how much, on average each support ticket costs to resolve, how long it takes and how many support tickets customers log each month on average. If you're setting up a monthly or annual subscription, does that include unlimited support incidents per month or is there a limit to the number of tickets that users can open? Or, if you charge by the hour, will you offer unlimited hours per subscription period or will you limit the number of hours? Many of Microsoft's premium support plans generally restrict the number of tickets that can be opened in any given year. In contrast many third-party WordPress support firms will often provide unlimited support services for a fixed price per month. - How to prevent users from accessing free support tickets. - If you are planning to limit the number of tickets for each user, how to track the number of tickets activated and how to automatically redirect to your store when they run out of tickets. - How to handle manual tickets that are supposed to be paid for e.g. phone calls or emails. - How will payments be integrated into your help-desk software? 2. How to service the support tickets you receive. What help-desk software are you going to use? 3. If you currently offer support services to your existing customers how will you communicate any relevant changes in your support policies without causing a major backlash? As you can see there are multiple permutations of business models that you could use to implement and operate your paid support service. This offers welcome flexibility, allowing you to choose a business model that will suit your support offering and provide maximum value to your customers. But, this flexibility can also create software complexity. After all, knowing what business model you want to use is one thing; finding the software that can accommodate that flexibility is quite another. The next question therefore is what software currently exists that can help you implement your chosen model? There are a number of options available to you depending on whether are going to run your online support platform via WordPress or some other technology platform. WordPress websites can use our PAID SUPPORT for WooCommerce in combination with the free Awesome Support plugin. All the models described above are supported and it is tightly integrated into the help-desk system. The payment collection system is aware of what's happening inside of the support ticket system and can prevent the opening of new tickets as necessary. It offers options to easily up-sell users when they do not have an existing support contract or have exhausted their support quota for the current month or year. www.paidsupport.com is a hosted service that includes most of the model combinations described above. However, you might find their built-in help-desk a bit limited. Still, it is an easy way to get started with charging your users for support. www.awesomesupport.com is a beta service that implements our help-desk plugin for WordPress along with an option to use the Paid Support add-on. It is still a WordPress site but it is hosted by us, freeing you of the burden of creating yet another website! If you have an existing support operation where users are used to free support, the least disruptive way to roll out your new support plans is to create a new tier of support first. This tier should have some differentiating features such as more rapid response times or additional services or maybe a dedicated phone number or email address. Introduce this new tier using your existing customer contact channels (email, newsletters, sales channels etc.) If possible, make sure that the new tier adds value and is sufficiently different from the current offering not to alienate your current customers. Position the change as an improvement to help meet varied customer support needs more effectively. Once your customers are used to seeing this new tier it will be easier to up-sell them to the paid service. Perhaps offer existing customers a discount if they switch to the paid service within a specific time-frame or offer them all a 30-day free trial. You can also include the new paid-for service option as the default option when selling your products or services to new customers. Depending on where you are in your business cycle you might find that it’s a lot easier than you think to implement a paid support model, especially if you already offer a free support option. What’s especially exciting is that software now exists for both WordPress and non-WordPress platforms to help you implement your new plans. Whether you are seeking to create more money from your expertise or you want to turn an existing cost-based support service into a new revenue stream, there is now software to help without the hassle. If you would like more information please use our contact form to drop us a line or ask questions!